“Cocktail branding” sounds less like a marketing tactic and more like an excuse to get to happy hour. These days, though, companies of all shapes and sizes are using the custom cocktail as a way to connect with consumers at pop-ups and promotional events. 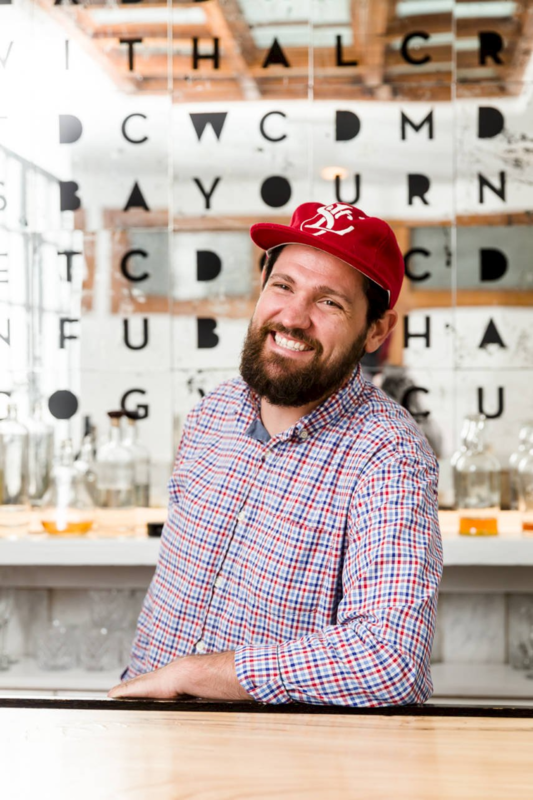 Matt Longueville is the founder of Barkeep. Photo by Virginia Harold. As the founder of Barkeep, Matt Longueville set out to create an elevated cocktail catering company. What he didn’t realize was what Barkeep would become: a powerful tool for brands looking to connect with influencers and prospective audiences. Today, Matt and his team craft custom recipes and experiences for growing brands, from local cafes and fashion labels to nationally distributed spirits. As part of our ongoing drink series, we sat down with Matt to talk bartending, branding, and what’s next in the world of beverage. Katherine: Tell me about Barkeep. What exactly do you do? Matt: Essentially, we are an elevated beverage catering service, whether for public or private events. We also do consulting work for spirit companies, helping them with recipe creation, marketing, and events. For the past three years, we’ve built our brand in St. Louis, but we’re looking to grow into the national market in cities like Nashville and Denver. Katherine: I’ve heard you describe Barkeep as “part marketing agency.” Talk about how brands are using cocktails and Barkeep as a branding tool. Matt: We do a lot of experiential events. A brand will come to us and say, “We want to get 50 influencers in a room and introduce them to this brand.” It’s just a different way for brands to market their products. We also represent brands at trade shows. A lot of times, you go to a trade show and it’s like, “Oh, try this cocktail that’s been pre-made in a jug.” We approach it a little differently. I’ve developed a custom cocktail concept where the bartender actually interacts with each person. You start by picking your spirit and then there are four flavors to choose from. It’s an interactive experience makes the brand more memorable. Katherine: When you got into the cocktail business, did you anticipate that your work would overlap with marketing and branding? Matt: Not really, but now I want it to coincide even more. I want to help young brands grow using our marketing skills as recipe makers and bartenders. There are small distilleries popping up everywhere. I like creating the first round of cocktails that will go up on their website. It helps tell their story in a way that falls in line with their product. Katherine: Do you have any examples of brands outside the beverage industry that you’ve helped promote? Matt: We worked with Dakota Grizzly, which is a local men’s outdoor brand. Originally, we planned this event for the VIP section at LouFest. Of course, LouFest fell through and the event never happened, but the lead-up worked out really well. We got 16 well-known St. Louis bartenders to come in and work shifts in the VIP section. Dakota Grizzly made us these slick branded work shirts and they gave the bartenders all this clothing so they could take pictures and post on Instagram leading up to the festival. The bartenders loved it. We planned to have a photographer come in and take a bunch of shots at the event with the bartenders in their new work shirts. It was a nice, subtle approach to promoting the brand. Katherine: What’s your process for creating a branded drink? Matt: I’ll ask a couple of questions. What do you have on hand? What do you think of these flavors? What can I get at the farmer’s market this week? It’s also about the brand we’re working with. We’re doing an event next week where one of the honorees is Big Heart Tea Company, so we’re going to do four flavor options using tea infusions to tie it all together. Katherine: Along with the work you do for brands, you’ve also created drink pairings for a number of chef-led events. What’s your typical process for collaborating with a chef? Matt: The last one I did was with Nate Hereford, who is the former chef at Niche. We did a big 60-person dinner at the World’s Fair Pavilion in August. I also did one for David Choi, the chef from Seoul Taco and Alec Shingel, one of the sous chefs from Vicia. A lot of times, I like the chef to set the flavors. The food’s gotta be first and foremost, and then I’ll land wherever they land. These chefs are super smart. While planning the Super Seoul Sunday Dinner with David Choi, we went to international grocery stores and he introduced me to ingredients commonly found in Korean food, as well as non-alcoholic Korean beverages to pair with West 32 Soju. Soju is often referred to as the Korean vodka. Katherine: What’s an ingredient you’re into at the moment? Matt: I’m really intrigued with rum right now. I love introducing people who are big whiskey drinkers to different kinds of rums. It’s not just Bacardi and Captain Morgan and Malibu. There’s so much more to it. We’ve been doing a lot of hot drinks the past few weeks. We’ve got our hot ginger apple cider recipe that’s dialed in. We’ve been doing a hot rum toddy with orgeat, which is an almond syrup. People love it. Katherine: Let’s end with a tip. For the amateur bartenders of the world, what’s your advice for mixing up a great cocktail? Matt: Learn how to make simple syrup. If you learn how to make that, you can add all sorts of different flavors. Then you need two simple recipes: the old-fashioned and the sour. From there, you have an endless number of cocktails you can make subbing in different flavors of syrup. Thanks to Matt Longueville for chatting with us. For videos, recipes, and more info, visit barkeep.us. Be sure to check out the rest of our drink series, including the case study for Fizz & Folly, a cocktail-themed collaboration with Matt and his team.